BLAINE, MINN. — Jack Nicklaus will headline the “Greats of Golf” exhibition Saturday, when this unique assemblage of golf legends highlights the second round of the Champions Tour’s 3M Championship at TPC Twin Cities, located just outside Minneapolis, Minn. For the second year in a row, Jack will team with friends and fellow legends Gary Player and Lee Trevino, while Arnold Palmer will once again join the fun as a team captain. The Greats of Golf and the second round of the 3M Championship will air on Golf Channel from 3:00 to 6:00 p.m. ET. The Greats expected to compete in this best-ball challenge are: the Tony Jacklin-captained team of Johnny Miller, Dave Stockton, and Tom Weiskopf; the Don January-captained team of Fuzzy Zoeller, David Graham, and Hale Irwin; and the Palmer-captained team of Annika Sorenstam, Nancy Lopez, and Pat Bradley. To be eligible for the Greats of Golf exhibition match, players must be members of the World Golf Hall of Fame, have 20 or more career victories on the PGA and Champions Tours, or are former major championship winners. 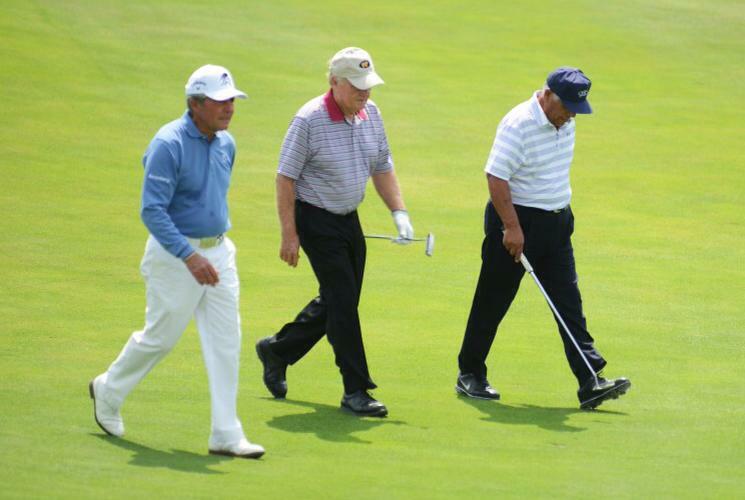 Nicklaus, Palmer, Player and Trevino have a combined 40 major championships between them—with Nicklaus owning the “bear’s” share with a record 18 majors. It was recently announced that the foursome will collaborate for the first time on a golf course design at The Greenbrier, the acclaimed resort in West Virginia. The 3M Championship is the 16th of 25 events on the Champions Tour. The 54-hole tournament begins today, with Kenny Perry defending his title and Tom Watson returning to senior competition after playing recently in his final Open Championship. The Greats of Golf exhibition became a part of the event in 2004. Nicklaus first appeared in the field in 2014, drawing the biggest crowds of the day. It was the first time Nicklaus had played TPC Twin Cities, a course designed by Palmer that opened in 2000. For more information about the 3M Championship, visit 3mchampionship.com.